As if there weren’t enough reasons to want to buy a Model X , Elon Musk just gave us another one – Model X’s Bioweapon Defense Mode. This mode will rapidly clean air inside the car – like really really clean it. To prove the point, Tesla built a ‘bubble’ and put a Model X inside it and then they pumped this bubble with highly polluted air (1,000 µg/m3 of PM2.5 – our famously polluted Delhi air was 120 µg/m³ on 6 April). After switching on the bioweapon defense mode, in less than 2 min, the pollution levels fell to what is effectively pollution free air!! Not just that but this mode even cleaned up some air around the car (not by that much though). Below is the graphical representation of this test. 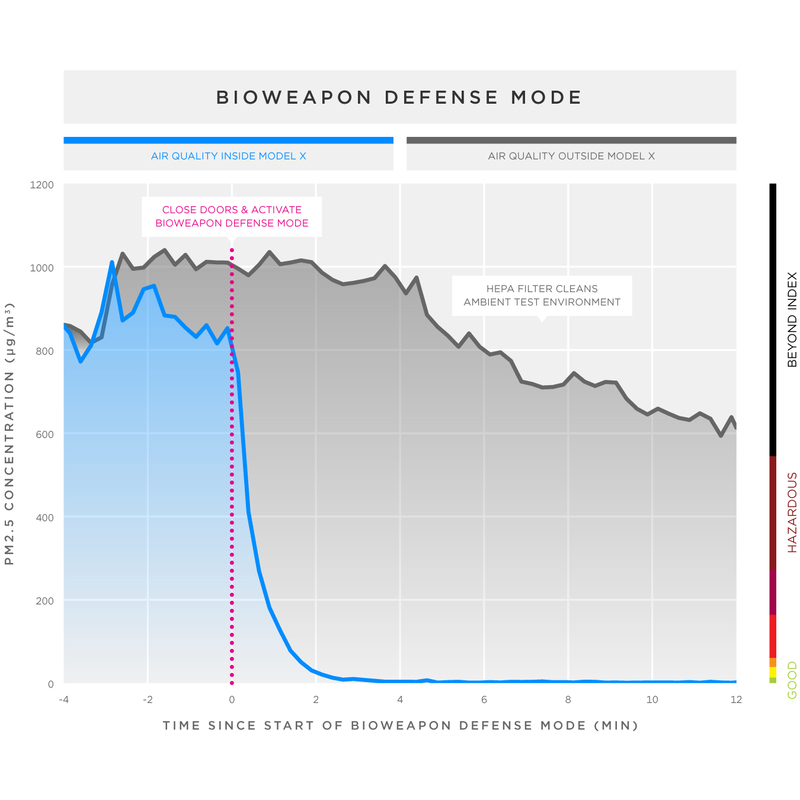 Notice how the blue line falls down drastically after switching on the bioweapon defense mode. Also note that the grey line (air outside Model X) falls as well but air quality remains at dangerous levels. As per Tesla, “You can literally survive a military grade bio attack by sitting in your car”. Here is the Tesla blog post which details this test and its results. Previous Post Previous post: What happens in an internet minute? Next Post Next post: 6 battery myths busted!